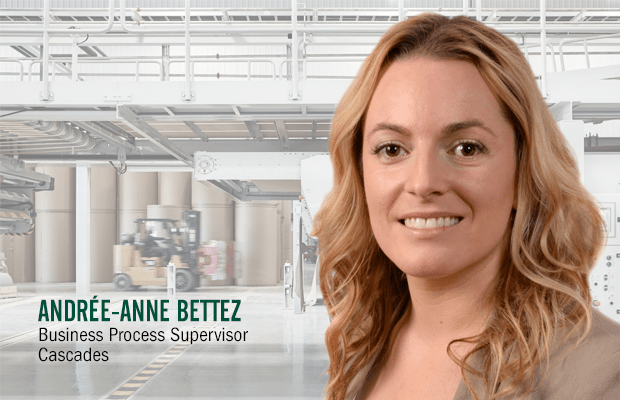 Curious, meticulous, and with a talent for bringing people together, Andrée-Anne Bettez, Business Process Supervisor at the Cascades Containerboard Head Office, is a source of inspiration thanks to her unflagging drive and determination. First hired as a financial analyst ten years ago, she now oversees a team of nine other Cascaders, optimizing our processes and helping to roll out Fibre (project to transform Cascades’ information technology systems) throughout Cascades’ units. How did she get here? No doubt, her passion for learning and problem-solving and her love of teamwork had something to do with it! Wherever she goes, Andrée-Anne absorbs best practices, asks questions and learns something new from everyone she meets. She seizes every opportunity that comes her way and looks at each new experience as a chance to grow. Andrée-Anne is gearing up for a brand‑new adventure, having recently been selected to join the first cohort of Leadership au féminin, a program created by the Chambre de commerce et d’industrie de la Rive-Sud to help spur the success of hardworking business women. Recognizing her management skills and her potential for growth, Andrée-Anne’s fellow Cascaders nominated her in the hopes she would be selected for this incredible opportunity. No-one was surprised when she was chosen! This experience will help Andrée-Anne fine‑tune her leadership skills and give her unique access to influential networks, inspiring leaders and through-provoking speakers. Since January, and for period of nine months, approximately 15 women meet every three weeks to take part in training workshops, mentoring sessions and networking activities. Through this program, Andrée-Anne hopes to sharpen her ability to engage colleagues, maximize her effectiveness and make a lasting impact. With her enthusiasm, her authenticity and her humility, she is sure to reach her goals! Cascades is proud to be represented by Andrée-Anne and we wish her every success in her career. To follow her journey, visit the website of the Chambre de commerce et d’industrie de la rive-Sud (French only).